This square-plan church was built in 1839–41 to a classical design by David Cousin (1809–1878); his landmark steeple was added in 1854–5. 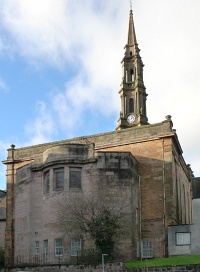 In 1912, Honeyman, Keppie & Mackintosh reseated Cousin's galleried interior and built a chancel in the form of a semicircular apse, with rich oak furnishings including a pulpit and organ case, all in Renaissance style. Authorship: A newspaper account of the newly-completed apse says 'the work has been carried out from the designs and under the supervision of Mr. John Keppie, F.R.I.B.A., of Messrs Honeyman, Keppie & Mackintosh.' 1 The style of the architecture and woodwork is consistent with Keppie's work elsewhere. Ronald Harrison, an early student of Mackintosh's architecture in the 1930s who had access to the office records, included the 'Chancel Screen' on lists he compiled of work he believed to be by Mackintosh and of drawings produced in the office during Mackintosh's time, but no evidence has come to light to support this attribution. Alternative names: Old Kirk Church, St Luke's Church of Scotland, West Kirk. 1: Greenock Telegraph, 28 August 1912, p. 2.